Usually, a lot of people placed their mattress on a base, foundation, or platform, which is collectively known as a bed. But what if you are planning to use the floor as your bed foundation. This could happen for some reasons. It might be that you have to accommodate several guests in your home, or maybe you have not purchased a box spring or platform yet. Others also prefer to sleep in a low-profile bed, thus leading them to just place their mattress on the floor. In these cases, using the floor as a foundation for your mattress might be a good idea. However, it is not as easy as it is. Right? We provide an in-depth analysis of floor mattresses in the market today in this post. In this post, we will present to you the pros and cons of using the floor mattress. For those who are planning to buy a new mattress, we have included in this post some reviews about the best 10 mattresses that you might consider. Also popularly known as a Tri-Fold mattress, this is the most usual type that functions well when placed on the floor. Commonly, these are available in small sizes (queen and below). These are also portable, lightweight, and less costly than the typical full-size variant. They are a good option if you have few guests who can be conveniently taken along on excursions. You don’t have to prepare a platform or base and a non-slip bottom for this mattress. 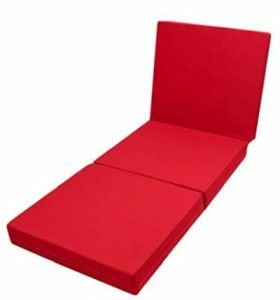 This can function well with a folding bed especially if their fold dimensions match. Other folding mattresses are also engineered to fit well with a chair bed, which is a great choice for students’ or kids’ rooms. Most folding beds are made up of various types of foam; however, it is best to choose those that are composed of memory foam. Commonly known as a tatami floor mat, Japanese bed, or roll-up mattress, these beds have the same design as a foldable mattress, but they can be neatly rolled up. Even though they can be folded, they look like a flat quilt in contrast to the earlier mentioned tri-fold design. 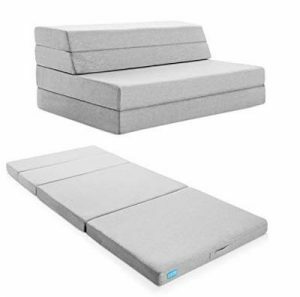 They are not also compatible with a chair bed, but they can fit well with futons and folding beds. 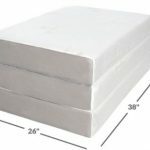 These resemble more of large mattress pads and can even act as a topper when needed; however, they are more lightweight and compact than the tri-fold mattress. These are usually composed of polyester, cotton, and thin layers of foam for extra comfort. So, Is It Really a Good Idea to Place Mattress on the Floor? A lot of people will just throw their mattresses onto the floor and use it for a night. A few also use the floor as a permanent mattress foundation. It is unusual for some to think about the possible cons that may occur when not using a bed frame. 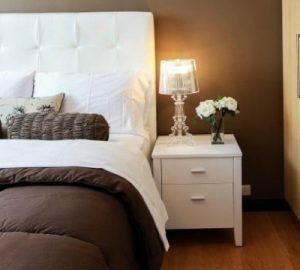 Small spaces and restricted budget urge many people such as students and working individuals to sleep on their mattress without using the typical raised bed. If you know the right ways on how to use the floor as a bed foundation, then you won’t have a problem in the future. Otherwise, you’ll encounter some consequences later on. In the following sections, we will discuss some issues that may possibly arise when you use the floor as a mattress base. Let’s check out below some pros and cons. Obviously, you can really place your mattress on the floor, and no one will stop you from doing that. However, you must be aware of the right ways on how to do it and be ready to deal with some issues that you may encounter in the future. Determine the mattress size and choose a suitable area to lay it. Ensure that space is properly cleaned before laying it and remove any dirt and dust. It is best to use a vacuum cleaner or mop the floor with water if it’s not carpeted. In addition, it is important to cleanse the laminate or wood floor with disinfectants like bleach to get rid of bacteria. Dry the area totally before laying down the mattress. If the floor is not carpeted, place something that can protect the mattress. It could be a foam or a polythene sheet. This will hinder the cold or heat waves to reach your body. To make this process more effective, place the foam or the polythene sheet in layers. Others also prefer to use a bed sheet, which is also effective. If you’re planning to place the mattress permanently on the floor, regularly air it and dry it out. It is essential to do this process every week. Do this by leaning the mattress upright against the wall. This way, the floor has also the chance to dry out. Moreover, get rid of dust, dirt, and organisms by thoroughly cleaning the area. Dust particles could possibly accumulate near the floor because of gravity and move around the room. If you sleep lower to the floor, then there’s a possibility that you inhale dust and contaminated air. So, if you’re allergic to dust, using the floor as a mattress foundation may not be right for you. Insects such as ants, spiders, and various kinds of bugs are commonly found in any parts of the world. Since your sleeping near the ground, there’s a tendency that these insects will climb up to your mattress. This is a serious issue for those who don’t want to sleep with creepy crawlies. In several places in Australia and Asia, snakes that entered in bedrooms during the day or night are common. Therefore, sleeping near the ground increases your risk to encounter these harmful reptiles. A lot of places around the world have humid climates. Molds and mildew can develop below mattresses that are permanently placed on the floor since the air cannot freely circulate throughout. This can be a danger to your hygiene and health. The presence of molds and mildew underneath the mattress can shorten its lifespan. Weather elements like cold and heat can easily reach you if you’re sleeping near the floor. Places that have cold weather have cold floors, and the cold can directly come in contact with your body, thus making you ill. Cold air is known to be concentrated on the floor. This is also the same threat in areas with hot climates. This well-known tri-fold mattress produced by Millard enables users to easily unfold or fold it when necessary. Great for small spaces like tiny apartments and mobile homes, it enables users to save space without compromising the quality of their sleep. It is also perfect for short-term sleeping accommodation; this can serve as a comfortable sleeping surface for your guests or as an extra bed when you’re going for an outdoor vacation. The Milliard 6-Inch mattress is made up of high-density foam that is certified by the CertiPUR-US. 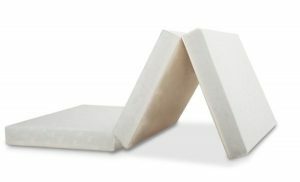 This foam provides the same orthopedic and therapeutic benefits as memory foam, but this is portable and less costly. This is available in Twin, Full, and Queen sizes. In addition, this also features a non-slip bottom, which makes it a great folding foam mattress for floors. Moreover, this is also wrapped with a bamboo cover. Certainly, this mattress offers value for money. This is a typical Japanese floor mattress that is composed of white cotton, a foam layer, and a polyester fiber layer. It has a weight of 14lbs. This space-saving portable mattress can be used for several purposes. It is great for guest rooms, yoga studios, massage clinics, and outdoor activities such as camps and picnics. With a thickness of 3 inches, it offers adequate support and is durable enough. This can be easily folded or rolled up when not in use. 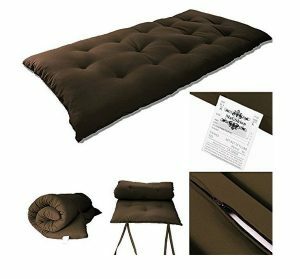 This is suitable for those who want to lie down on a comfortable bed but who don’t need a tri-fold mattress or a folding chair bed. This mattress is available in Twin, Twin XL, Full, Full XL, and Queen sizes. 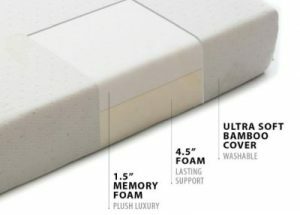 This well-known 4-inch portable folding foam mattress from LUCID is perfect for camp sites, cabins, and minimalist homes. It is a great indoor and outdoor sleep product that can serve as a replacement for a typical sofa or bed. You can simply utilize this as a bed during the night and a sofa by day. You can place it permanently on your floor or fold it conveniently. This is not the same as other products that are difficult to maintain. The mattress features a removable and washable cover for easy care. The foam used in this mattress is certified by the CERTIPUR-US and contains antibacterial and dust- and mite-resistant properties. This foldable mattress comes in a wide variety of colors and is available in Twin, Full, and Queen sizes. This is a great option for those people who enjoy traveling and socializing. This can be easily stored when not in use. 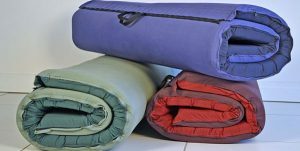 This is ideal for sleep overs, trailers, mobile homes, and camps. The 4-inch foam is a bit firm, and the firmness is enough to relieve back pains, although it is not made up of memory foam. In addition, it is engineered to be compact and portable; however, it does not offer the same level of comfort as the regular full-size mattress does. This is enclosed with a cover that is made up of 100% polyester. This product is manufactured in the USA. This is a good choice for those people who are on a budget. The Zinus twin size 4-inch tri-fold mattress is made up of a combination of various types of foam that offers exceptional support and comfort. This mattress looks like similar to their full-size variant that has a multilayer design. It is composed of 1-inch memory foam, 2-inch Viscolatex responsive foam, and 1-inch high-density base support foam. These layers offer exceptional spine support for back, side, and stomach sleepers. The materials used in this mattress are certified by the CERTIPUR-US, and these are infused with natural ingredients that effectively eliminate odor and maintain proper ventilation, thus preventing the formation of molds and mildew. This product is indeed great when it comes to durability, support, and performance. The same as their Resort foldable bed, the company offers a warranty of five years. The warranty is valid only if you choose not to lay the mattress on the floor. Most of the homes nowadays are multifunctional. 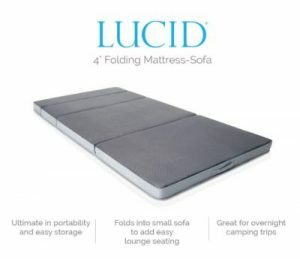 The LUCID 4-inch folding mattress is designed to be dual purpose. It can function as a chair bed or a portable mattress that can be directly placed on the floor. Base or platform beds are not necessary. If your home has a minimalist interior design, this can be a great choice. You don’t have to prepare an extra bed for your guests; you just have to set this as a bed chair. You can also pack this away if you’re going on a vacation. This is ideal for camping trips and RV trailers. Since this is made up of gel-infused memory foam, this certainly offers exceptional comfort and support. Its compact design is well suited for tiny apartments and guest rooms. It is also lightweight and portable because of its fitted handles; therefore, this mattress is perfect for traveling. The foam used in this mattress is certified by the CERTIPUR-US. This means that it is of high quality and is safe for humans and the environment. It offers a warranty of 5 years. Its available sizes include Twin, Full, Queen and King. Overall, this is one of the best folding mattresses in its price category. This mattress is manufactured in the USA. 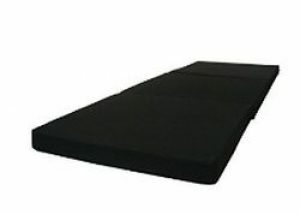 It is a black tri-fold foam bed that has a simple design, yet it is sturdy and portable. 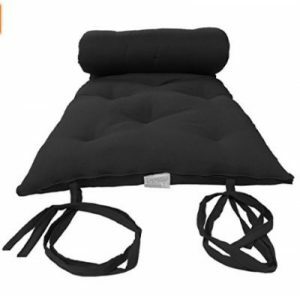 This can provide exceptional back support and enhance the quality of your sleep. Just like other mattresses in this review, it is also foldable for easy storage. However, this mattress cannot be converted into a chair bed. This is made up of 100% polyester; thus, its quality cannot surpass the quality of those memory foam mattresses. However, it is priced reasonably. This is ideal for occasional outdoor activities and guest rooms. If you care about the welfare of the environment and want to protect your family’s health, this foldable mattress is a great choice. This mattress is ideal for children. Composed of organic materials, this product is certainly safe for babies. This also adheres to the flammability standards implemented by the federal government. The Folding Pack n Play mattress is designed to be comfortable. It comprises natural latex foam that highly supports the spine. The foam is wrapped with a removable and washable cover that is made up of bamboo fabric. The materials used in this mattress contain hypoallergenic properties and is most suitable for pack ‘n plays. If it does not fit your play area or if you don’t have a pack ‘n play, then you can just make use of this as a comfortable floor mattress for children. For any reason, if you’re not contented with the product, just contact the company. They will replace it or return your money without any questions. 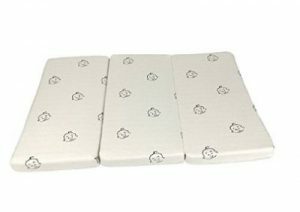 This is a good choice if you’re looking for a portable baby mattress. This type of tri-fold mattress is a great option for those who want to make the most out of their floor mattress. Since it is portable and foldable, it allows users to use it in several purposes. This is ideal for camping, RV trailers, mobile homes, and more. Its non-slip bottom makes this mattress stand out from the rest of the mattresses that are reviewed here. It comes with a carry bag for easy storage and transport and for protection against dust. Moreover, it is also wrapped with a poly-Jacquard cover that is washable for easy care. 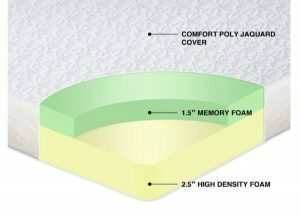 This mattress is composed of several layers; these include the 1.5-inch memory foam that is certified by the CERTIPUR-US and 2.5-inch high-density base foam that is also present in some typical full-size mattress versions. As a whole, the company is staffed with pros that are experienced in making typical mattresses; so this mattress is not a bad option at all. The Tatami Floor Mat is a simple must-have sleep item. This high-quality and portable mattress provides users with comfort wherever they are. The simple design of this mattress allows customers to experience restful sleep in both indoor and outdoor settings. This is manufactured in the USA and comprises cotton batting and a foam layer that are wrapped with a 100% polyester cover. 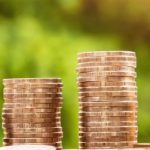 The product certainly offers value for money.